Victor is a high-quality grain free puppy food that combines the meaty goodness of beef meal with the sweet texture of sweet potatoes for a combo that puppies find irresistible. 33% protein helps puppies develop strong lean muscle mass. Menhaden fish meal adds valuable DHA to help puppies develop a strong brain. Combination of beef, chicken, fish, and pork gives puppies a lot of flavor and variety in one food. 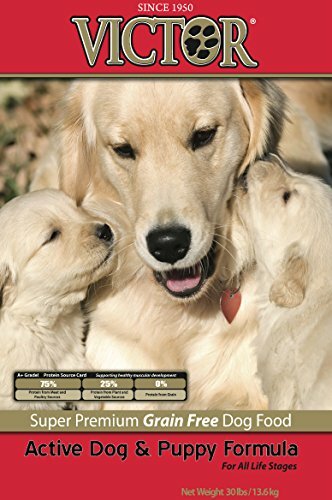 Great for nursing mothers, pregnant dogs, and puppies alike. Can be fed to very active dogs that require a high-performance dog food. I have no reservations about recommending this premium puppy food. It contains top quality ingredients and has probiotics to help aid in good nutrient uptake and digestion. Victor gets consistently good feedback on all their formulas. Those that want to go grain-free and are looking for a reasonably priced puppy food should consider Victor. While this food is labeled for puppies, if you have a very active dog that loses weight too easily, this formula can help them maintain body condition. Victor also gets points for being available through multiple online retailers like Amazon and Chewy so you don’t have to worry about availability like with some premium brands. The fact that this puppy formula has a lot of fish protein makes it attractive to dogs as well. It seems like any food that I get my dogs that has a little bit of fish taste to it gets gobbled up in seconds. Beef Meal, Sweet Potato, Chicken Meal, Peas, Chicken Fat (preserved with mixed Tocopherols), Pork Meal, Menhaden Fish Meal (source of DHA-Docosahexaenoic Acid), Dehydrated Alfalfa Meal, Dried Egg Product, Flax Seed (source of Omega 3 Fatty Acid), Yeast Culture, Natural Chicken Flavor, Potassium Chloride, Dried Kelp, Salt, Montmorillonite, Tomato Pomace (source of Lycopene), Dried Carrot, Choline Chloride, Hydrolyzed Yeast, Dried Chicory Root, Taurine, Zinc Amino Acid Complex, Hydrolyzed Yeast, Vitamin E Supplement, Iron Amino Acid Complex, Manganese Amino Acid Complex, Ferrous Sulfate, Zinc Sulfate, Selenium Yeast, L-Carnitine, Vitamin A Supplement, Vitamin D Supplement, Copper Sulfate, Vitamin B-12 Supplement, Niacin Supplement, D-Calcium Pantothenate, Thiamine Mononitrate, Biotin, Magnesium Amino Acid Chelate, Riboflavin Supplement, Calcium Iodate, Pyridoxine Hydrochloride, Lecithin, Fructooligosaccharide, Folic Acid, Yeast Extract, Dried Enterococcus Faecium Fermentation Product, Dried Lactobacillus Acidophilus Fermentation Product, Dried Aspergillus Niger Fermentation Product, Dried Bacillus Subtilis Fermentation Product, Yucca Schidigera Extract, Citric Acid, Rosemary Extract. Gradually replace your current puppy food with Victor over a 5-7 day time period. At 3-4 weeks old puppies will want to nibble on solid foods. To get them started out you can soak Victor in warm water or broth. Allow puppies to eat as much as they want for 20 minutes. If feeding a litter, make sure to spread food out in dishes enough that puppies do not have to fight to get a share. It is essential that puppies are able to get adequate food during the major growth stages. Bigger litters can create a competitive environment that can leave one or more puppies not getting as much as the others. Mothers may need as much as four times the amount of food indicated by the feeding charts displayed above. As a general guideline, allow mothers and pregnant dogs to eat as much as needed to maintain body conditions. Those that are nursing should be fed several times throughout the day. Allow 20 minutes per feeding and let the mother eat as much as she can. Victor provides a good starter kibble for puppies. Pregnant and nursing mothers can also benefit from this high protein, grain free, and probiotic enriched ration. This is an affordable grain-free puppy food. Dogs that have allergies or are recovering from illness or surgery may also use this kibble to get an extra boost in nutrition and maintain good muscle tone.